This fishing report will close out 2017, but there are plenty of fishing opportunities for all regions of Maryland through the winter. The preseason stocking of trout has begun and will pick up pace in January and February. Yellow perch are moving into the upper reaches of the tidal rivers while crappie, chain pickerel, catfish and walleye will stay active. 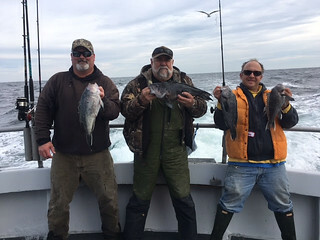 The months of January and February often present the best opportunity to catch trophy-sized tautog off Ocean City. Happy Holidays from all of the staff at Maryland Department of Natural Resources Fishing and Boating Services; enjoy the best of family and friends through this wonderful time of the year, and enjoy the great Maryland outdoors together. Before we get into this week’s fishing report, I wanted to remind everyone that they can submit their own fishing reports and phots to the Maryland Angler’s Log. To post a report, please email your name, hometown, photos, location information and additional content for your report. All information is optional, but encouraged. New reports are posted daily during the busy fishing seasons. The windows of opportunity allowed by Old Man Winter were sparse last week, thanks to strong winds. 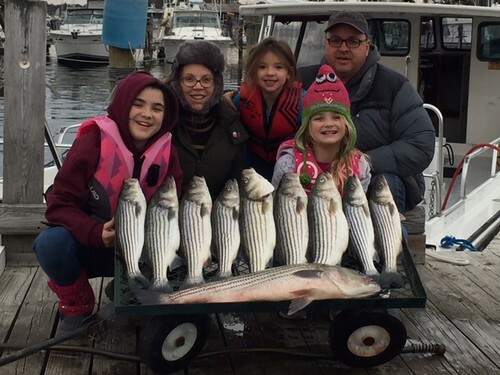 There have been a few days of calm winds and mild temperatures lately, making for some fun fishing trips out on the Chesapeake Bay in search of striped bass. As most anglers know, Dec. 20 is the last day to fish for striped bass in the Maryland portion of the bay until the Spring Trophy Season opens on April 21, 2018. However, all Maryland portions of Chesapeake Bay are open to catch and release striped bass fishing only through Dec. 31. Also, the Virginia portion of the bay and the Potomac River are open through Dec. 31. Bay surface water temperatures are now in the mid to low 40s with slightly warmer water at 40-foot depths. This is where you will find striped bass suspended close to the bottom. 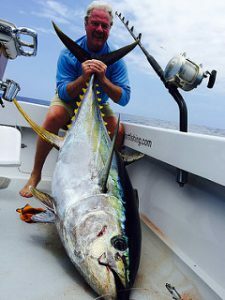 The main shipping channels in the upper bay have been the place to be trolling or jigging and the 40-foot depth tends to be the sweet spot. Heavy inline weights are in order to get tandem rigged swimshads and parachutes or spoons down to where the fish are holding. Some anglers are also using their planer boards to cover more water and different depths when targeting the large fall migrant fish. The Bay Bridge piers, abutments and rock piles continue to hold a lot of large white perch and striped bass of varying sizes at 40-foot or deeper depths. Jigging has been the way to fish here and more than a few anglers will finish out the season at this spot. South of the bridge and through the middle bay region most of the action has been taking place along the western edge of the shipping channel from Thomas Point south past Breezy Point. Inline weights have been taking lures down to the 40-foot channel edge, and some of the larger lures intended for the large fall migrant striped bass that have arrived are being pulled at various depths. Large spoons and parachutes have been two of the more effective lures to use for the larger striped bass. In the lower bay region striped bass in the 20-inch to 32-inch size have been fairly plentiful along channel edges on both sides of the bay. Trolling has been very popular, especially when on a boat with a heated cabin this time of the year. A mix of parachutes, swimshads, spoons and surge tube lures are being pulled behind inline weights and umbrella rigs. 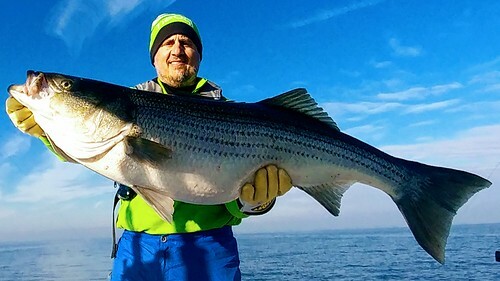 Most everyone is putting larger lures in their trolling spreads in hopes of hooking up with one of the large fall migrant striped bass that have been frequenting the region from Tangier Sound to the Potomac River. Anglers in the lower bay region till have some fun fishing opportunities through the end of the month. The approach channel in the lower Potomac has been a great place to troll large diving crankbaits and a mix of large spoons and parachutes for the large fall migrant striped bass. Those looking for the resident striped bass in the 20-inch to 28-inch size range have been trolling medium-sized lures along the channel edge from St. Georges Island south to Point Lookout. Fish can also be found suspended along these channel edges with depth finders, and jigging with soft plastics in the 8-inch to 10-inch size range has been effective. Soft plastics in pearl or chartreuse combinations have been the ticket. White perch are holding deep over good oyster bottom in many of the larger tidal rivers and channels in the bay. Since they are so deep, a bottom rig baited with pieces of bloodworm tends to be the best way to catch them. Moderate temperatures until Saturday will be replaced by cold temperatures through next Wednesday. These typical December conditions will continue to cool Maryland bay waters for any game fish still remaining in Maryland waters. The Maryland portion of the bay continues to have a well-mixed water column with suitable oxygen conditions from surface to bottom. However, there are slightly warmer bottom water temperatures so anglers may want to scan these deeper channel areas for fish. As a new feature, you can now see temperature and oxygen levels by depth. Just click on any station on the Temperature by Depth map or the Don’t Fish Below this Depth map. As reported from the National Oceanic and Atmospheric Administration buoys, main bay surface water temperatures have dropped to the mid 40s at the Gooses Reef south (44 degrees) and the mouth of the Potomac River (45 degrees). Water clarity is generally good, with a few reduced water clarity areas in the Patapsco River and along the western shore from the Bay Bridge down to near Dares Beach. Expect normal to below normal flows for streams and rivers entering Maryland’s portion of the bay. There will be excellent tidal currents conditions through Sunday as a result of the new moon that just occurred on Dec. 18. Until Spring 2018, the Fishing Conditions Forecast will be posted monthly to highlight the latest results from the department’s water monitoring cruise. However for more detailed and up-to-date fishing conditions in your area of the Chesapeake Bay, please continue to check out Eyes on the Bay’s Click Before You Cast. Since this feature is designed for Chesapeake Bay anglers, drop us a line with comments or suggestions. At Deep Creek Lake, ice-fishing folks are getting itchy for some hard-water fishing conditions and rumors were that a few venturesome souls were seen out on thin ice last week in McHenry’s Cove. Our recent warm weather nixed any hope of the ice on the lake developing into something that might be safe. and the lake is open at this time. It will take several weeks of cold weather to develop anything that looks like safe ice. The upper Potomac continues to run cold, clear and low this week as the lack of any appreciable rainfall has caused the flow rates in the river to be low. Colder water temperatures have the smallmouth bass nestled deep in what are often referred to as winter holes. Small to medium sized soft plastic jigs and paddletail type baits worked slow and close to the bottom is a good way to fish for them. Walleye love cold water and will be eager to take the same lures. Water temperatures in the upper Potomac are close to freezing. Anyone fishing from any type of vessel in the upper Potomac must wear an approved personal flotation device from Nov. 15 through May 15. More information can be found on page 29 of the Maryland Guide to Fishing & Crabbing. The first preseason trout stocking occurred Dec. 19 in the delayed harvest area of the Youghiogheny River. There will be future stocking of trout in many of the trout management waters in the upcoming weeks. 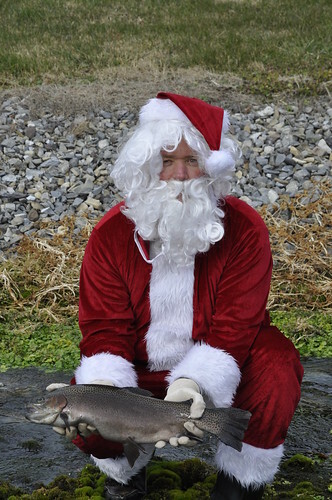 The stockings will be posted on the department’s trout stocking website and by subscribing to the department’s email service. Many trout streams and creeks in the western region are experiencing low flow rates and trout anglers may see stockings adjusted in regard to suitable locations where trout can be placed. Due to low flow rates and clear water, light lines and careful approaches will be in order. The trout stocking website contains a lot of information to trout fishermen including stocking location maps. Largemouth bass tend to be holding deep now and holding close to hard cover. Working grubs, hair jigs and blade lures slow and close to the bottom can entice them to pick up a lure — the bite will be very subtle. Crappie are providing good fishing opportunities in ponds, lakes, reservoirs and tidal waters throughout Maryland. They will be holding deep near structure such as bridge piers, fallen tree tops and marina dock piers. A small jig under a bobber is a great lure to use but small minnows will definitely catch more crappie than anything else. 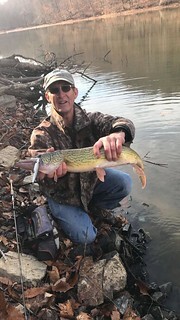 Chain pickerel are common in most landlocked and tidal waters in Maryland and offer some fun light-tackle fishing through the winter. They don’t seem to mind cold water temperatures and are active. They can often be found lurking near some type of hard structure. A variety of lures will work as well as live minnows. They tend to inhale baits and have sharp teeth, so a good pair of pliers is very helpful when unhooking them. In the tidal waters, yellow perch are moving up the rivers and holding in the deeper areas as water temperatures get colder. In the next month the lower Susquehanna traditionally holds a large population of yellow perch. The department has a map with locations yellow perch will be found during their spring spawning runs. Fishing in these tidal waters down river of these areas should put you onto yellow perch in the next month. A variety of catfish species provide good fishing through the winter months. Channel catfish can be found in most of the tidal rivers flowing into the Chesapeake. Blue catfish are the dominant species in the tidal Potomac south of the Wilson Bridge, and also to a lesser degree in the Patuxent and Nanticoke rivers. Flathead catfish can be found in the Conowingo Dam pool and the lower Susquehanna River. Fresh cut baits on a simple bottom rig tends to be the best way to fish for any of these species. Blustery weather has been no stranger to the coastal areas this past week. but there has been and will continue to be windows of opportunity for anglers. The much anticipated influx of large striped bass moving south along the coast has yet to light any fires in Maryland waters to date. The action seems to be stalled north of Cape May, N.J. A few hardy souls have been trolling within the 3-mile state regulatory line but they report only seeing schools of menhaden and diving gannets. There has been some striped bass action along the beaches, at the inlet and back bay areas but most fall short of the 28-inch minimum. They do offer a lot of light tackle action for anglers casting soft plastic jigs and paddletail swimshads. Fishing for sea bass continues to be good at the offshore wreck and reef sites, where limit catches are possible at times. Large flounder are still being caught and at times spiny dogfish can cover up a wreck, and captains have to move to another site. The tautog season opens Jan. 1, 2018 with a limit of four fish per day and a 16-inch minimum size. This is often the best time of the year to catch a trophy-sized tautog. Beginning Jan. 1, 2018 anyone wishing to fish for sharks off Maryland must have a shark endorsement on their HMS permit, take online shark identification training and use non-stainless steel circle hooks. This is an attempt to help protect dusky sharks. More information can be found at the NOAA Fisheries website for Highly Migratory Species. Want the Weekly Fishing Report sent right to your inbox? Click here to sign up!